Last time I visited London, England, I was able to visit with one of my dearest friends, Anne Marie. We had not seen each other for a couple of years, due to my ill health (see: survivingbreastcancernow.com), but it was as if we had been apart for ten minutes. Some friendships are just like that. We had tickets to go to see “The Pajama Game” at the Shaftesbury Theatre but met early so we could have dinner together and a good old catch up. I am vegetarian and Annie loves her fish, so she guided us to The Rock and Sole Plaice. It was super! It was a warm, dry summer evening so we sat outside and shared a hummus and flat bread starter. The portions are enormous! Had we known this we would not have had a starter. That would have been a shame, because it was delicious. We shared a bottle of Pinot Grigio and a salad with our main courses. 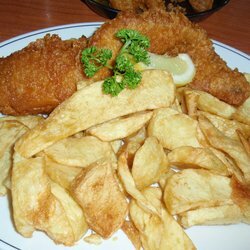 Annie had the haddock and chips. I had the fired camembert and chips. Neither of us could finish our main courses either! The salad was fresh and crisp, the meals hot and clearly freshly prepared. We really enjoyed our meal and compared to most prices in London, the cost was very reasonable. 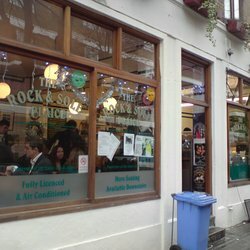 I look forward to eating at The Rock and Sole Plaice again in the future.